LTO WORM Tape provides a Write Once Read Many formats protecting valuable data against accidental erasure and prevents alteration of archived data files. LTO WORM is available for LTO-3, LTO-4, LTO-5, LTO-6, LTO-7 and LTO-8 tape drives. LTO WORM tape was developed to allow organisations to store large amounts of critical data as a backup/archive job and once written these tapes could not be overwritten or tampered with. Regulatory compliance - including the Sarbanes-Oxley Act of 2002, the Health Insurance Portability and Accountability Act of 1996 (HIPAA), and SEC Rule 17-a-4(f) -- there is a need for a cost-effective storage medium that can preserve corporate data in a non-rewriteable, non-erasable and unalterable format. Found in Generation 3, 4, 5, 6, 7 and 8 formats (as well as included in the roadmap for Generations 8 - 10), the LTO Program WORM implementation is designed to provide users with a very cost-effective means of storing data in a non-re-writeable format to address compliance regulations. An LTO drive with a WORM cartridge will not erase or overwrite data on a WORM cartridge but will read or you can append to it. An LTO WORM tape is identical to a normal LTO tape cartridge except its LTO-CM chip identifies it to the drive as WORM and the servo track is slightly different to allow verification that data has not been modified, and may come with tamper-proof screws. WORM-capable drives immediately recognise WORM tapes and include a unique WORM ID with every dataset written to the tape. There is nothing different about the tape medium in a WORM cartridge. Typically the LTO WORM tapes have a different colour packaging. 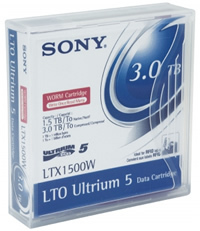 All Sony LTO WORM tape media has a lifetime guarantee against defects. If for any reason your LTO WORM tape becomes defective Sony will send out a replacement. In addition to this if the media fault leads to data loss and it has been kept in the correct environmental conditions and used correctly Sony also provides a tape data recovery service. Please call 01256 331614 for pricing and further information.